The debut album by Melic is an energetic electronica project that throws a few trippy twists and turns into a genre that has seen better days. Imagine Ozric Tentacles doing techno, and you'll get an idea of the flavour of this one. Melic makes nice use of drum machines, varying their sound throughout a piece and doing a lot more than just your standard techno rhythms. There are also a lot of nice atmospherics on the album. Samples are used judiciously, and rarely bog the music down (the sole exception might be Hey Thatz Good, which is built around a rather annoying sample of what sounds like someone gagging. It may have seemed like a cool idea at the time, but it's a rather irritating foundation to what could have otherwise been a great track). Waystation has some of the coolest percussion on the album, drum machines working overtime, like pinballs bouncing frantically around inside the machine. Levitation is probably my favourite track on the album. It has a moving, majestic feel to it, and although predominantly instrumental, it has a few vocals, both male and female, swimming around in the mix, but they are so skilfully blended that it wasn't until my fourth or fifth listen that I actually noticed they were there! Another standout is the slow, 12-minute album closer, Goodbye Sun. It takes its time getting off the ground, but once it gets going, it becomes the darkest and spaciest cut on the album, with distant guitar notes ringing through a dusty haze of synthesizer washes. It's the perfect ending to the album, letting you drift off into your own dimensions of thought. 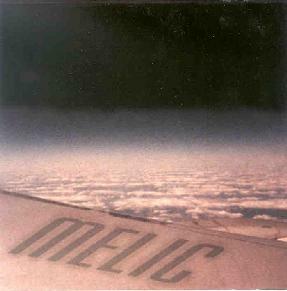 In short, Melic's debut is not what I would call a masterpiece, but it does give a boost to a genre that has been suffering lately from lack of new ideas. For more information you can visit the Uncanny Soundings web site at: http://www.uncannysoundings.com. Contact via snail mail c/o Uncanny Soundings; 16613 Laverne Ln; Anderson, CA 96007.